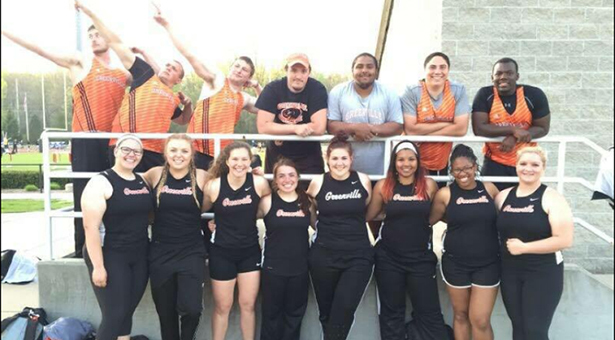 The Greenville College track and field team competed well at the Rose-Hulman Twilight Invitational this past weekend and came up with some first place finishes in a few events that included a field of nine teams. “Rose-Hulman is our very favorite track to run on,” Nathan Potts said, as many of the distance squad members would agree. The track at Rose-Hulman is an enclosed area that blocks most of the wind, so athletes tend to run better times at this meet. 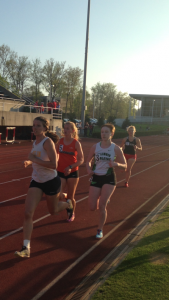 Molly Works and Megan McKee reached their season bests in the 3000-meter steeple chase. Works was able to get under twelve minutes for the first time this season and was only one second off her lifetime best, as she finished in first place with a time of 11:56.8. McKee ran a lifetime best of 13:06.9 for a second place finish. Chelsea Gilles was speedy in the 100 and 200-meter races. Gilles was able to get new lifetime bests in both of her races. In the 100, she finished with a time of 12.69 for a third place finish, while she won the 200 with a time of 25.10. A few more ladies ran to new lifetime bests on the track. 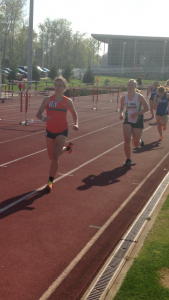 Lia Kruse was able to a get new personal record in the 1500 meter race with a time of 5:06.4, while Sheridan Noll and Brianna Cox ran the 1500 for the first time in their careers. Noll came out on top by winning the second heat of the 1500 with a time of 5:15.9. Cox ran great as well, with a time of 5:31.3 for a seventh place finish. Brooke Goodyear started off the 3000-meter race at a great pace to set her up for a strong finish. She was picking off other runners right and left as she neared the last lap. Goodyear finished with a new lifetime best in the race with a time of 10:37.9 for a third place finish. There were also standout performances in the women’s discus and hammer throw. Jantzen Michael had a great throw of 108’6” in the discus, while Deborah Cunningham had the second best throw of the day of 90’1” in the discus. Marideth Tate, Taylor Willis and Tori Papez had similar success in the hammer. Tate had the best throw of the day of 137’6”. Willis threw a new personal best of 132’10” and Papez was able to qualify for Christian Nationals with a throw of 129’8”. The highlights of the day for the men’s team were the 800-meter race and the 4×4 team. John Mangold wanted a taste of being “Mr. Flash” on the day, as he ran a lifetime best 3:58.7 in the 1500 meter race. Andrew Sharp is still “Mr. Flash” in the 800-meter dash as he ran a time of 1:51.3 for the track record at Rose-Hulman. Sharp got the team ten points with his win in the 800. Nathan Potts was close behind with a new lifetime best of 1:54.9. Jaylen Shelton ran a time of 1:57.1 and Parker Wray finished with a time of 1:58.7. Matt Hughes ran a great time in the 400-meter dash with a lifetime best of 51.66. Hughes was only .16 tenth of seconds from qualifying in the 400 for Christian Nationals. Phil Wilsman and David Martin got new personal records in the shot put. Wilsman hurled a great throw of 34’7.75” and Martin had a solid toss of 32’5.5”. LC Washington made a great throw in the hammer throw of 130’5”, which is his new personal record. The 4×4 team ran their best time of the year in 3:21.6. 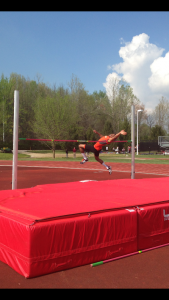 Greenville Track and Field took advantage of the great weather and fast track at Rose Hulman. The team hopes to continue to improve in the next few meets before Christian Nationals. Greenville will travel to Illinois College next week, before the SLIAC Conference meet at home on May 7. We hope to see a huge crowd in attendance as GC competes to win conference.